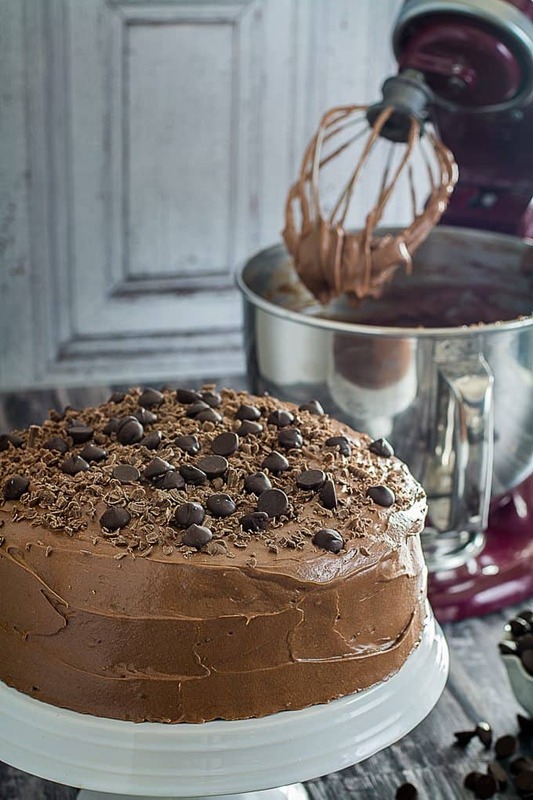 Two layers of indulgent chocolate cake surrounded by a sweet cream cheese chocolate frosting. 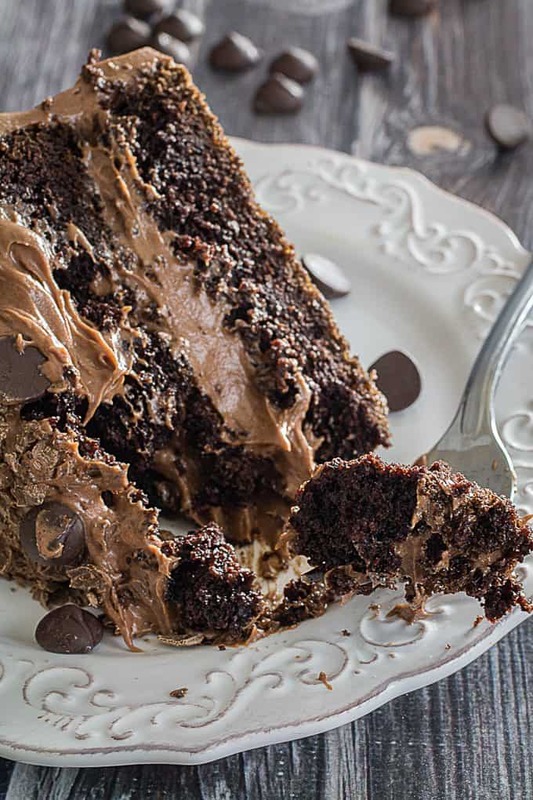 This rich and decadent Gluten Free Double Chocolate Cake is perfect for birthdays and holidays. Or even just for the weekend! 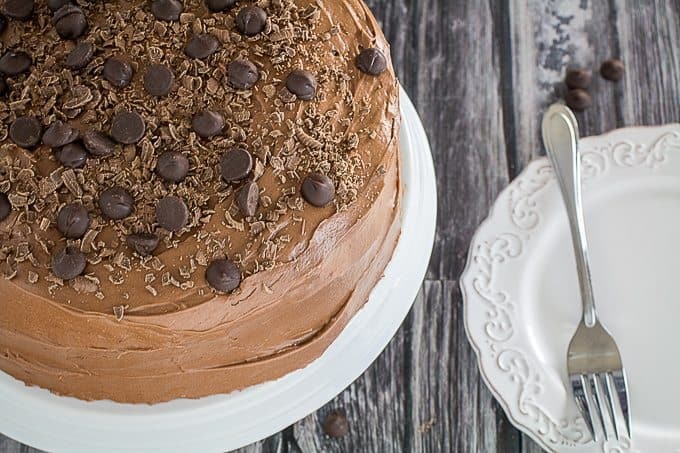 (Chocolate + Coffee) – Gluten = The cake that will change your life. Ok, maybe I’m exaggerating, but that is the formula for blissful happiness. No, seriously, it is. I’ve tested it several times already. How many slices were there again? 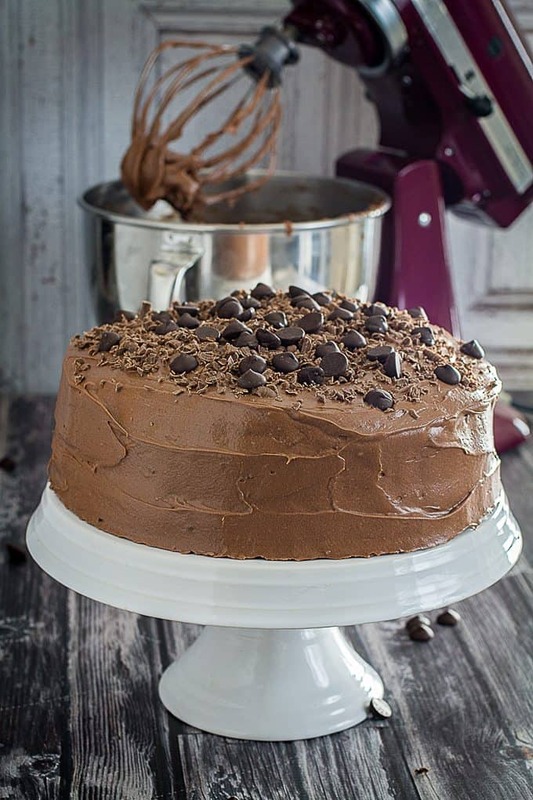 This cake is all of the things I’ve been looking for in my life, wrapped up in chocolate cream cheese frosting and topped with chocolate chips. Because sometimes I’m just in the mood for chocolate! It’s super moist, rich, and definitely perfect for the next birthday cake on your schedule. Move over, box cake, there’s a new kid in town, named Gluten Free Double Chocolate Cake. When you’re gluten free, sometimes you miss the little things. Like really, really good cake. You know, the kind that you can just pick up from the bakery on your way to a party. 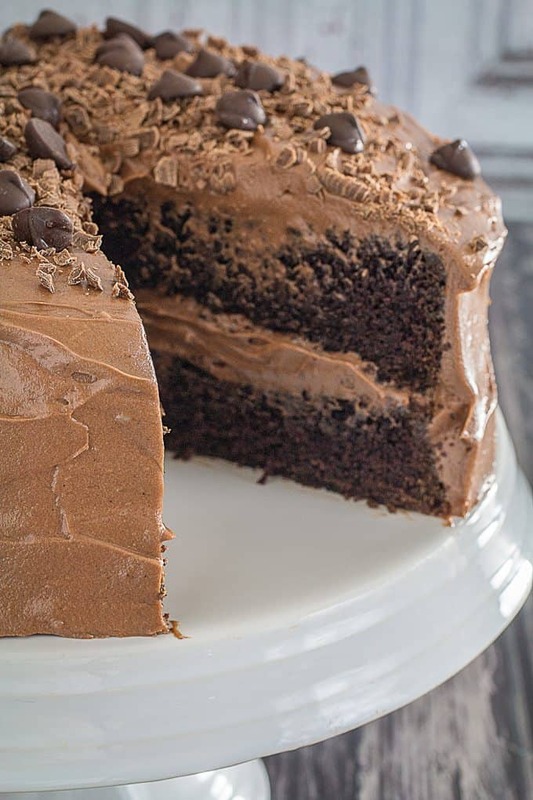 The fluffy, rich kind of chocolate cake that your guests will still be raving about at your next get-together. While this one might require a little extra work compared to a quick run to the store, it’s definitely worth it. This is, without a doubt, the best gluten free double chocolate cake ever. That’s right, ever. The best part? Your guests won’t even be able to tell it’s gluten free. I don’t know about you, but I have a terrible habit of picking up the closest gluten free box of cake mix at the store. Then spending approximately 2.5 seconds actually baking the thing. And you know what happens? The cake always comes out OK.
Not great. Not amazing. Just… OK. Which is fine, if you want to settle for the OK things in life. Personally, I can live with that sometimes. If I don’t have the time or energy to put in to something, or if it’s practically midnight and I suddenly remember that I promised to make cupcakes for that thing I’m supposed to go to the next morning. I’m not the only one who does that, right? I made this for Andrew’s birthday, and you know what? Nobody could even tell that it was gluten free. Not. One. Person. At the risk of sounding like a broken record, I’m going to give you the secrets of making the perfect gluten free double chocolate cake. These are the key things that I’ve really taken to heart when making a recipe. They’re rules to live by, at least when it comes to gluten free baking. Use cream, not milk. If you don’t have cream, add a tsp of lemon juice to milk and stir it together before adding it to the cake. The acid in this reacts with the baking soda, helping your cake rise to its intended fluffy texture. All Purpose Flour Weighs 140 Grams. Ok, this one is really for when you’re converting a recipe to gluten free. But I cannot stress this enough. Regular, gluten-y all purpose flour typically weighs 140 grams. So, if a recipe calls for 1 cup gluten-y all-purpose flour, you need to weigh out 140 grams of gluten free all-purpose flour. Trust me, your baked goods will be better. This really helps cut down on the “dense” issue a lot of gluten free baked goods have. Figure out your flavor, then double it. I almost always use some kind of extract in my baking. Usually vanilla, sometimes almond, or even coconut. They really bring up the flavor, while hiding some of the harsher notes of the gluten free flours. So, if you would normally add 1 tsp of vanilla extract, add 2 tsp instead. And there you have it. 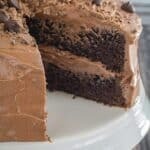 My 3 keys to success, and a few of the main reasons this gluten free double chocolate cake came out so darn good. 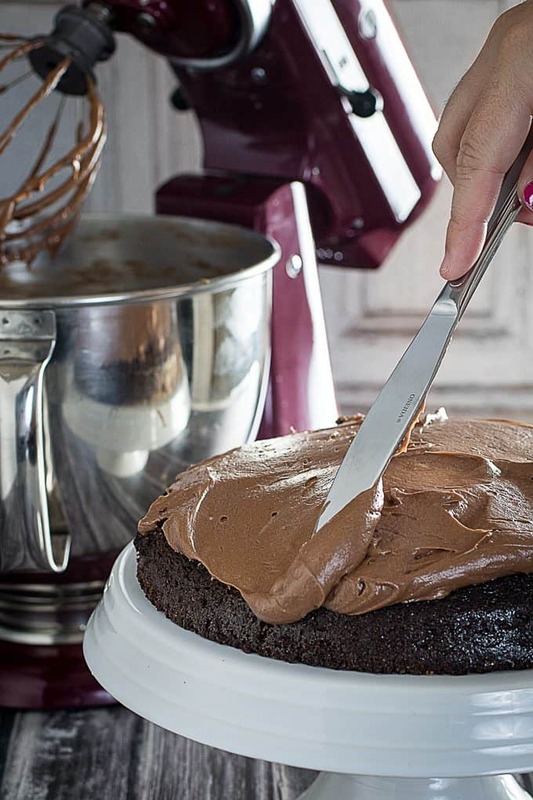 The chocolate frosting recipe is pretty much my go-to when it comes to chocolate baked goods. 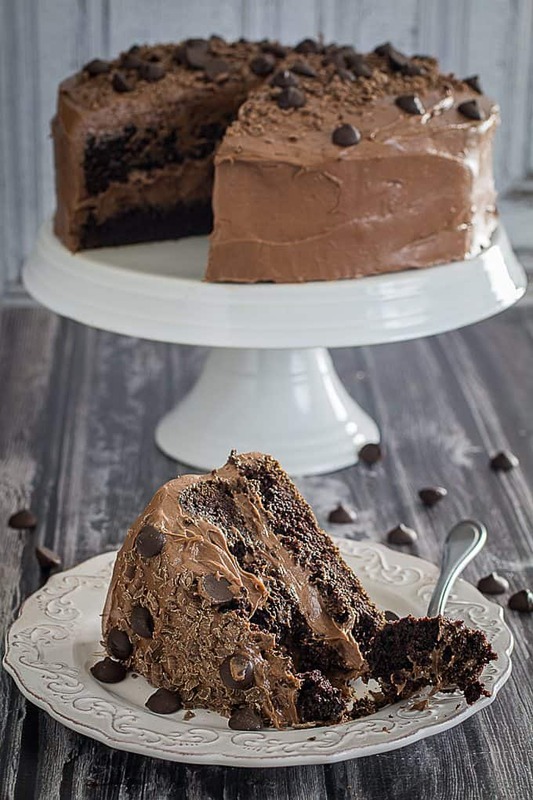 It just goes really well with this gluten free double chocolate cake. I’ve also tried it on vanilla cupcakes. It was a big hit! Or, you know, by itself. What makes this cake so fantastically amazing? Personally, I’d say it’s the really rich chocolate flavor you get. The secret ingredient to achieving this insanely delicious chocolate flavor? Move over, and prepare to be amazed. That’s right, two of the best things in the world, combining to make something that belongs in outer space. There’s no comparison for it here on this earth. Ok, maybe my Chocolate Chip Mocha Breakfast Smoothie comes close. I really like the coffee-chocolate combination. Million dollar idea: Chocolate Cake flavored coffee. No, I know what you’re thinking, but not mocha. I’m talking actual chocolate cake flavor here. I’d probably drink a giant cup of that several times a day. In a mixing bowl combine dry ingredients (flour, sugar, cocoa, baking powder, baking soda, salt). Add eggs, cream, oil, and vanilla extract. Slowly stir in coffee until all ingredients are well combined. Pour batter evenly into two greased 9-inch baking pans. In a stand mixer, combine cream cheese and butter until smooth. Slowly add confectioners sugar and cocoa powder. This batter can be thin, but it will bake up just fine! Want to bake this for my 12 year old grand daughter so don’t know exactly how wild she’d be about the coffee flavor. If I don’t want to use coffee, what liquid should I use instead–just plain water? The cake is UNBELIEVABLY AWESOME and AMAZING! As my Yorkshire friend would say, this is super smashing great. I followed the instructions for the cake to the letter and my 5yo and 2yo are begging for another slice. Thank you for this wonderful recipe! Finally a chocolate cake i can eat. I was diagnosed with celiac and was devastated because I have such a sweet tooth until this happen! this cake looks great! !…what changes would i need to make if i wanted to make it non gluten free? could i substitute the gluten free flour for the same amount of regular all purpose flour? Hi Dhara, Thanks! I would try this recipe with the same amount regular flour. If it’s too thin, you can try adding an additional 1/4 cup flour, but I’d try the 1-for-1 amount first. This batter is a little thinner by nature, so keep that in mind, too. Just a question which gluten free flour do you usually use? Does this recipe work with other types of flour and does the flour have added gums or straight gluten free flour combination? Tried this last weekend and followed recipe exactly. It was amazing!! Everyone loved it, it was moist and had a great consistency. Not a big coffee flavor, it just adds density to the chocolate.